Dr Caroline Farey of the School of the Annunciation in Devon and myself will be teaching a weekend course, Sacred Art and the New Evangelization in Kansas City, Kansas, on the weekend of June 12 -14. 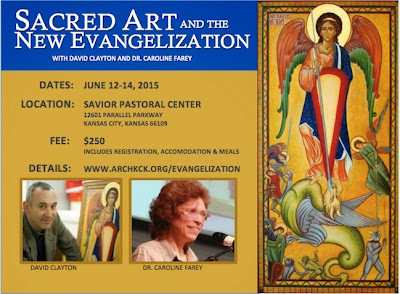 It will include talks from both of us and the praying of the liturgy of the hours through the weekend. Register here. Pope Benedict said that he believes that the Domestic Church will be the driving force for the New Evangelization. With this in mind and as part of this course, we will be praying the Liturgy of the Hours. The intention is that this will do more than simply bring the community of students and teachers together (which it will do); we hope to see those who attend take this away with them and introduce the practice to their families and parishes. The material we use is simple enough that people can sing it easily, and beautiful, so that they will want to. Anyone who can hold a pitch when they sing and is not afraid to sing in front of their friends can and will be able to continue on their own, or pass it on to others for use in their own homes and parishes afterwards, and build communities in faith around them. So why not start thinking out of the box...or out of the cell? Take a beautiful, simple Vespers into hospitals or prisons in a form that patients and prisoners and will want to sing with you? We can take Christ from the monk’s cell to the prisoner’s cell, so that the two become synonymous. In conjunction with this, students will be taught how to pray with sacred art, so that their icon corner really does become the focus of prayer and the heart of the home. We will learn, for example, how the traditional layout of the icon corner reflects in both content and form the themes that Benedict brought out in his essay on the New Evangelization. This adds to the power of the prayer in the home to transform us supernaturally, so that, despite ourselves and through God’s grace, people see Christ in us, and they believe that He can give them what they want most in life. The price for the weekend which includes room and board is just $250, which is extraordinarily good value.